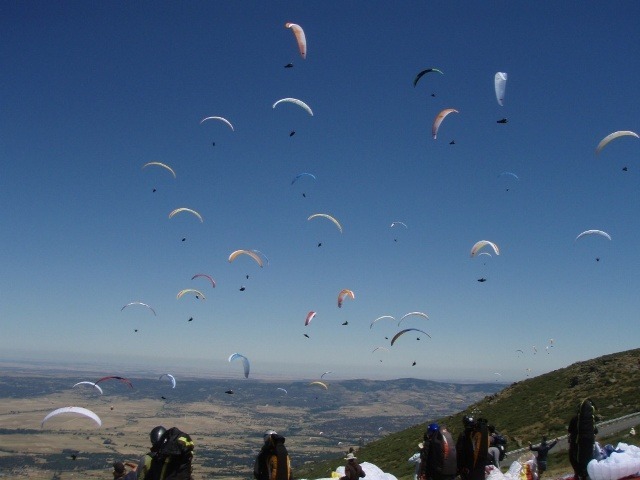 In this article will discuss one of the most important factors in being successful in Paragliding racing – Flying in the Gaggle. So why fly in the Gaggle? The golden rule : The Gaggle always works. Flying by yourself leaves you vulnerable and you have got no help if you lose the thermal and when you are on glide. More pilots in the air with you means you have more pilots sampling the air mass and telling you what’s happening around you. Flying in the gaggle provides you with a safety net to be able to move around with the gaggle. When leaving on glide the gaggle will spread out and this will increase your chances of finding a better glide line or even mark the next thermal. You will be able to find the thermal core ten times quicker as you will have a visual reference where the other pilots are going up and you can adjust accordingly. You can easily assess the height in altitude of the thermals, try look at what altitude the other pilots are leaving the climbs. Inexperienced pilots are often leaving the thermals too early and that extra 50-100 meters in altitude can be the differance in getting to goal or not. A strategy that often works is to “Pimp” or “Nevilling” people by letting your friend go first and follow them on glide, ideally a bit higher. It is almost impossible to do this from below. When you are above them you can easily adjust to better “lifty” lines. You will find yourself with pilots with a higher skill level and you can learn from them. You can base your decision making on theirs and learn where you would be making mistakes. In the next article we will look at Gaggle etiquette.